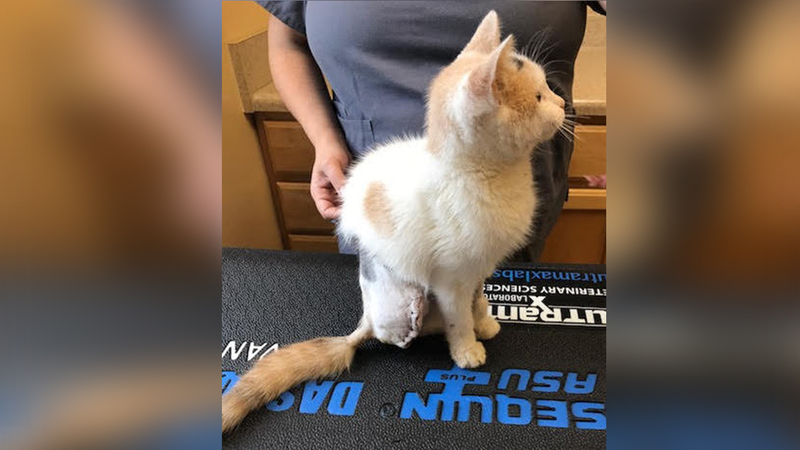 FRANKLIN COUNTY (WTVD) -- A 12-week-old kitten is recovering after having her leg amputated. On Friday, Abacus was rescued from Fort Bragg after sustaining a horrific leg injury. Previously, Abacus was being cared for by a man stationed at Fort Bragg who looks after a feral cat colony near the base. The man contacted Purr Partners about getting the kitten help. Within 24 hours of being rescued, Abacus had her back leg amputated. But vet techs at Bunn Animal Hospital said she is recovering like a champ. "She is the sweetest cat you have ever met and purrs like a freight train, even in the face of such an awful injury," an official with Purr Partners said. Abacus is expected to make a full recovery; however, officials said it will be a lengthy one. Those who would like to donate to her care, or the care of any other animal, can do so through the organization's website.